This entry was posted in Green living, Policy, Sustainable development, Urban development on October 31, 2011 by Claire Mathieson. A look at an entire city that composts and others that are joining in. Composting – the systematic collection and decomposition of organic material meant to divert waste from landfills and to return vital nutrients to growing plants – has not gained as much ground as recycling has since the environmental movement began, but many American cities have successful programs. While anyone can compost in the comfort of their own home with nothing more than a bin of dirt and a bunch of worms, few are interested in hosting the slimy Earth dwellers and would be much more likely to compost if they could dispose of their food scraps and yard waste as easily as they can their garbage and recycling. I was lucky enough to grow up in the San Francisco Bay Area, arguably the capital of the green movement in America. The Bay is no stranger to municipal composting; San Francisco has mandated composting as a key part of its effort to reach zero waste by 2020, and Alameda County Industries is responsible for disposing of garbage, recycling, and yard waste (composting) for the East Bay cities of Alameda – where I live – and San Leandro. ACI had one of the first collection programs in the Bay Area, and its relationship with Alameda serves as an excellent model for how an entire city can implement a composting program. In 2002, StopWaste.org spearheaded a waste reduction program in Alameda County, leading ACI to begin allowing food scraps and food-soiled paper like takeout containers to be emptied into the yard waste bin, which provided a diversion for food waste that before would have gone to a landfill. 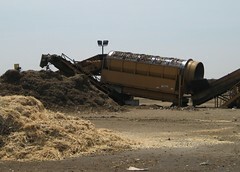 The organic matter placed in the “green bin” is collected by a special organics truck and taken to the Newby Island Composting Facility in Milpitas where it is ground, screened, and arranged into windrows, or rows. The windrows are then turned and watered to enhance the decomposition process until the finished product – compost – is achieved. According to Teresa Montgomery of ACI, the nutrient-rich matter is then sold to the public, to garden outlets like Orchard Supply Hardware and Home Depot, and to farms. The composting process at Newby Island. While ACI’s program has been operating successfully for nine years, it’s had its share of challenges. “Running an organics collection program is costly,” assures Montgomery, who says their greatest expenditures are “having to provide another collection cart…having to create additional collection routes… trying to educate the public regarding proper sorting…[and] processing the organic materials.” ACI maintains the program not for profit but to meet California’s waste reduction goals and, emphasizes Montgomery, “because it’s the right thing to do!” ACI has had to put a great deal of effort into public education, as it is not always intuitive what can and cannot go into the organics bin. 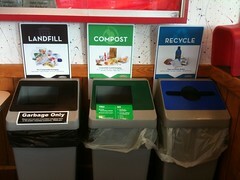 One thing that can be confusing is how to deal with bio-plastic products, or “spudware.” Some composting facilities have the infrastructure to deal with this seemingly green alternative to generic plastic, but others like Newby are unable to process them and usually screen them out and send them to landfills. Montgomery says, though, that “Alamedans are eager to participate and do so correctly about 90% of the time.” Finally, “the ‘ick’ factor has been [ACI’s] biggest obstacle all along.” Many consider using their green bins to be too messy, so ACI must provide advice on how to keep them fresh. While the Bay Area is rife with recycled organics, it does not have a monopoly on cities that compost. In 2009, Seattle expanded its program to reach its own zero waste goal, while Portland, OR was slated to begin a curbside collection program today. According to a national survey conducted by BioCycle, as of 2009 over 90 communities in the U.S. claimed their own residential composting programs, including cities in California, Colorado, Iowa, Massachusetts, Michigan, Minnesota, Ohio, Pennsylvania, and Washington. As composting on a grand-scale becomes more widespread, America’s need for landfills will shrink and our waste problem will gradually reach a more manageable level.